My biggest supporter and mood lifter extraordinaire, my sister, is the truffle queen. She makes them every year at Christmas time and hands them out as gifts. One year, I glommed onto my sister's truffle making abilities and gave some to my co-worker/friend, Ramona P. She hasn't stopped talking about these truffles since! If you follow the blog, you will remember P makes an appearance in several blog posts. In the past, I've not had much luck with making truffles. Chocolate is a tricky mistress partly because of its heat and moisture sensitivity. The quality of the chocolate can play a large role in the success of your final product too. However, over the years I've picked up some chocolate tips and developed more patience. I'm not a patient person by nature. Believe me, I am still no expert, but I do love being in the kitchen. Perfecting my craft is a life long lesson. I'm always looking for ways to improve on my skills. I've picked up a few truffle making tips along the way and here is a flavor that won over my family. In a small saucepan over medium heat, scald the heavy cream. If you have a cinnamon stick, toss one in, what can it hurt. You are looking for bubbles to form around the edge of the pan. Once you see them, remove the pan from the heat. Do not let the cream come to a boil. Let the cinnamon stick steep for about 1 hour. If you don't have a cinnamon stick, simply proceed to the next step without steeping the cinnamon stick. Meanwhile, chop up your favorite dark chocolate and set it in a large bowl. I used 72% dark chocolate from Trader Joe's. It comes in these big bricks that are over 1 pound. After an hour, reheat the cream over medium-high heat until hot again, but not boiling. 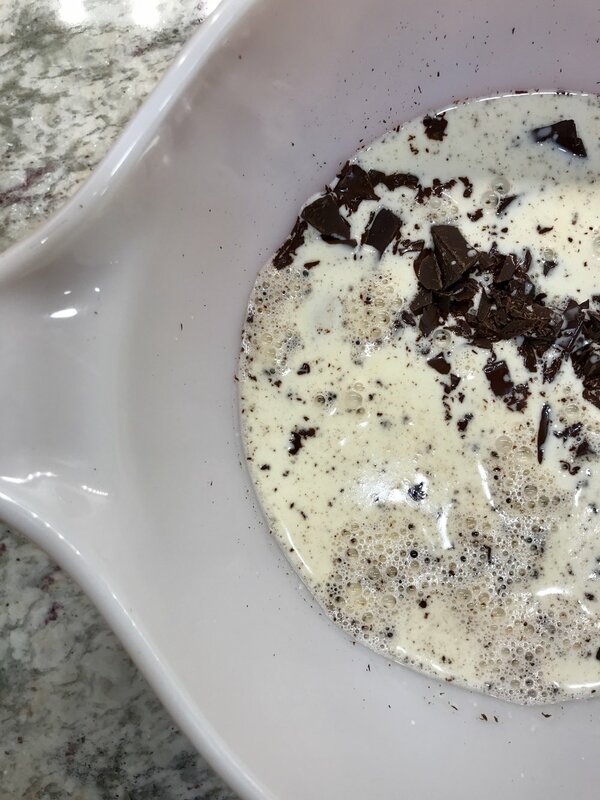 Pour the cream through a strainer over the chocolate. If you did not steep a cinnamon stick in the first step, pour the hot cream over your chocolate. Using a spoon to slowly stir the chocolate and cream until it comes together. Do not use a whisk. This will introduce bubbles into the chocolate mixture and not make for good truffles. The chocolate will take a few minutes to come together. Be patient. Remember in the beginning of the post I spoke of patience with chocolate. Find your happy place. 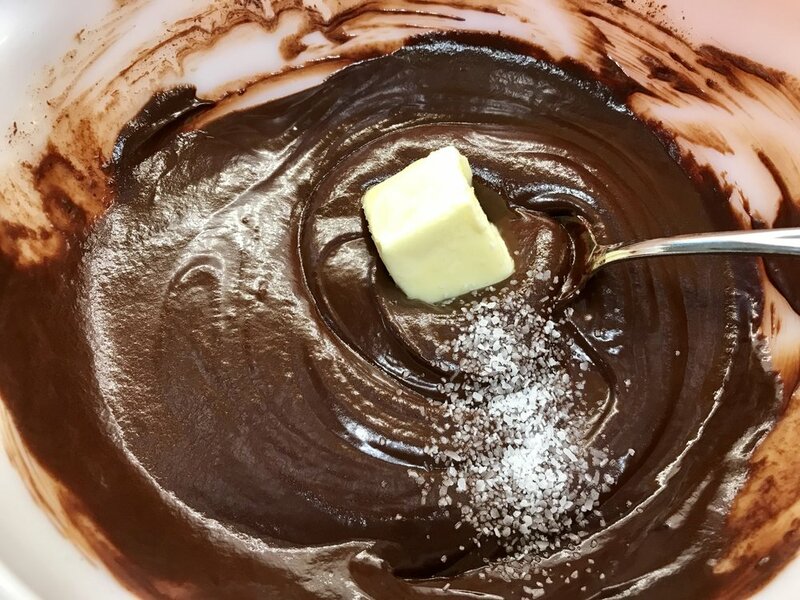 Once the chocolate has become cohesive, add the butter and the salt. Take your time to give the butter time to melt and mix with the chocolate. Refrigerate the ganache in a covered container overnight. The next day, use a tablespoon to make 1-tablespoon sized balls. Transfer the balls to a sheet pan lined with parchment paper. Refrigerate the chocolate balls for 20 minutes. Meanwhile, over a double boiler, melt the semi-sweet chocolate until smooth. Take the chocolate balls out of the refrigerator and drop each ball into the melted chocolate. Transfer the coated balls back to the parchment lined sheet pan and top with almonds, cocoa powder, or pinch of cayenne. Once the chocolate has set, store in an airtight container for up to 3 days.